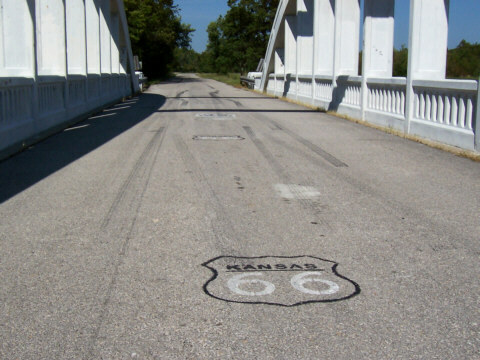 Kansas may have only 13.2 miles of the old Route 66 but that short stretch is packed with history and colorful remnants of the old road and the businesses that served the travelers. Allow plenty of time for your exploration of the Sunflower State. Especially allow time for Galena. This city was the center of lead and zinc mining in the early part of the 20th century and also was the scene of bitter and sometimes violent battles between mining companies and labor unions. But times have changed. When the mines closed Galena changed, becoming quieter, peaceful and a lot smaller. From a peak of about 15,000 people at the height of mining operations it now has less than 4,000 residents. The original road is often difficult to follow through town. But it's not hard to follow historic Route 66 through Riverton, home of Eisler Brothers Old Riverton store. The store owner, Scott Nelson, is president of the Kansas Historic Route 66 Association. 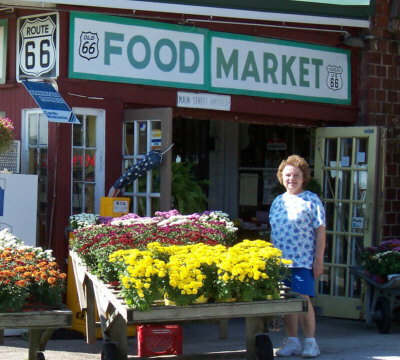 The store has been in business since 1925, before Route 66 became official. Inside we found a huge assortment of Route 66 souvenirs, memorabilia, and displays on the history of the area. It looked like a small museum. The store also serves many local residents with fresh meat and produce, canned goods and other household staples. Outside they had an assortment of hanging baskets and plants plus gardening supplies. Also available were cold drinks, snacks and ice cream. We decided on ice cream bars, which we enjoyed on the outdoor patio while we watched the traffic going past on the old Mother Road. No road trip would be complete without a picture of Jackie visiting a supermarket. 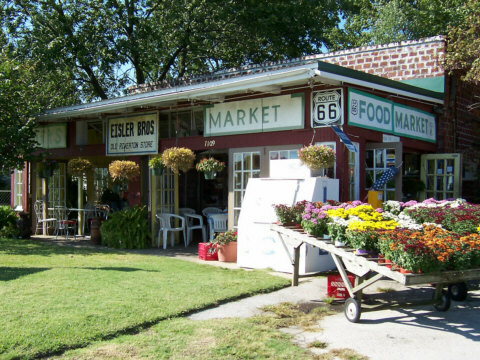 We didn't find any convenient supermarkets on Route 66 so Eisler Brother store will have to do. Just a few miles west of Riverton, just before Route 66 turns south, is last Marsh Rainbow bridge still standing on Route 66. It spans Bush Creek (named for the vegetation, not the President). It's now a one-way bridge. If you're westbound you can drive across but eastbound you'll have to cross the creek on the new bridge and double back. There were many examples of this type of bridge on Route 66. One, just east of here, crossed the Spring River in Riverton. The river there is wide and the bridge needed three arches to cover the width. It was dismantled in 1986 after a widening of the highway (and the main street) in Riverton. Now this remaining bridge is one of the most photographed spots on Route 66 and of course we did our share of picture taking and driving accross. It's a strange feeling, knowing you're driving on a piece of history.